If you’re a more visual learner, jump to the bottom of this blog post to watch our video on four tips for college success. 1. Help your student plan a budget. Depositing money into your child’s account is generous, but it may be more problematic if he doesn’t know how it’s intended to be spent. For someone who isn’t used to saving or budgeting long-term, a large lump sum might make them think that money will stretch farther than it will. Instead, sit down with him and organize what everything should cost per month – laundry, food, phone bill, spending money. Not only will this give him a system to fall back on while he’s planning out expenses, but it will get him in the habit of budgeting long before graduation. No matter what major your student chooses, everyone needs to understand finance basics to thrive in the real world. 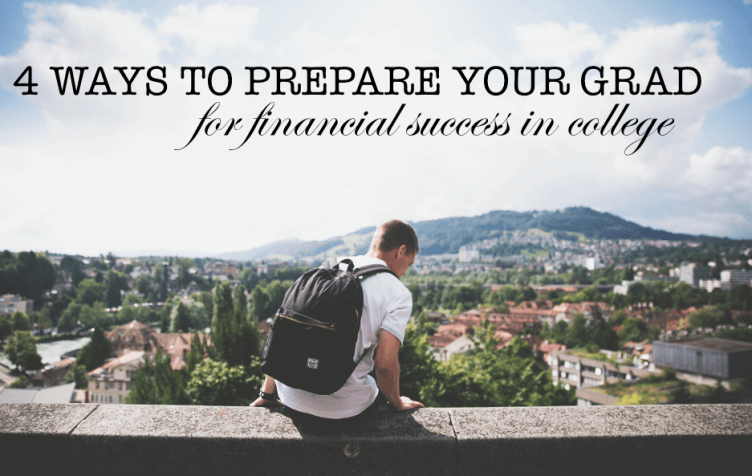 Before she heads off to school, take the time to talk candidly with your child about what goals she should be aiming for to achieve financial success in college. There are also plenty of books on the market (see 8 of our favorites here) to help get her thinking about budgeting and preparing for financial success in college. There are countless apps and budgeting systems out there to help her track spending, so do a little research together to pick out the best one. This is a great excuse for you to brush up on your budgeting, too. 3. Allow space for failure. Financial mishaps early on can be a fantastic tool for building a solid financial base, so give your student the freedom to make some of those mistakes. Did he blow through money too early in the semester? He’ll learn that eating takes precedence over new clothes, and Ramen can keep you fed for awhile. Does her car need a new tire immediately, but she can’t afford it? She’ll see that emergencies pop up out of the blue, and you need to have a fund for that. You don’t need to leave them high and dry, but experiencing the occasional money stress will prepare them to prioritize in the future. 4. Encourage a part-time job to foster financial success in college. Many parents are concerned that working in college will take away from their students’ educational focus. However, working during college comes with some important benefits, as long as the hours stay below a certain level. Not only will a part-time job give students a little extra spending money, but it can also offer valuable professional work experience, networking opportunities and a connection to the campus from a job through the school. The key is balancing the hours so that they don’t interfere with your student’s academic goals. If she can find that balance, working during college can be a vital experience to prepare for post-grad life.